Wednesday, 5th December 2018 – Last week Bolo Bhi conducted three Digital Security Workshops at Islamabad College of Arts and Sciences (ICAS) for middle and high school students. The workshop shared skills and strategies to secure personal devices and online communications, as well as methods to address specific issues prevalent in the younger demographic such as cyberbullying. The workshops focused on the importance of digital security, awareness of digital threats, and the methods tools to protect personal information. The high school session dealt with more technical aspects of digital security, delving into specific software and applications to secure the online presence of youth. The workshop with younger students focused on the explanation of basic security terms and emphasised conscious behavioural patterns, where students were encouraged to ask questions about their interactions online. This included thinking critically about whom they were connecting with on social media and what information they trusted their contacts with. The workshop was conducted by Research Associate Saleha Zahid and Communications Officer Aleena Niaz, reaching approximately 300 students. The response was very encouraging as students were curious and actively engaged in the sessions prompting further discussion into areas of digital security. Bolo Bhi is a research, policy, and advocacy organisation focusing on freedom of expression, right to information, and digital rights. 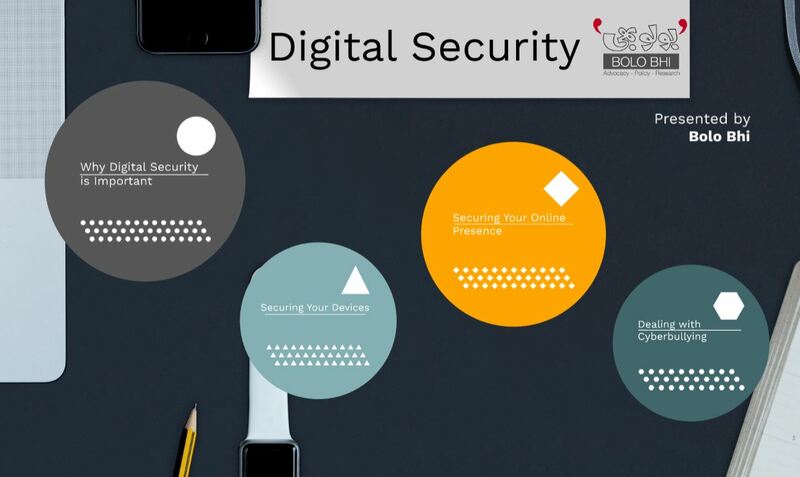 Digital Security Workshops inform and guide individuals on safe practices when interacting with the digital world. This is especially pertinent to students and the younger generation as they learn to think critically, identify potential risks, and become safe and responsible digital citizens.